Breaking Away, 2006-2018: Susan Swartz, "Nature Revisited 44," 2018, acrylic on linen, 42 x 84 inches. Courtesy of Susan Swartz Studios. The Jan Shrem and Maria Manetti Shrem Museum of Art announced its summer programming will include two shows and the introduction of fee-based workshops where people can experiment with some of the techniques the exhibiting artists are using. Photography: Bridging Art and Science — Students present their final projects from Science and Society 40, taught by Terry Nathan, professor, Department of Land, Air and Water Resources. Buehler Alumni Center, through Aug. 14. Breaking Away, 2016-2018 — Paintings by Susan Swartz. Manetti Shrem Museum, June 30-Sept. 2. You broke the ocean in half to be here — multimedia by Andrea Chung. Manetti Shrem Museum, June 30-Sept. 2. The Great Outdoors — Nature photography by Clyde Elmore, Cooperative Extension specialist emeritus, Department of Plant Sciences. Buehler Alumni Center, July 3-Aug. 29. Reception: 4:30-7 p.m. Friday, July 6. 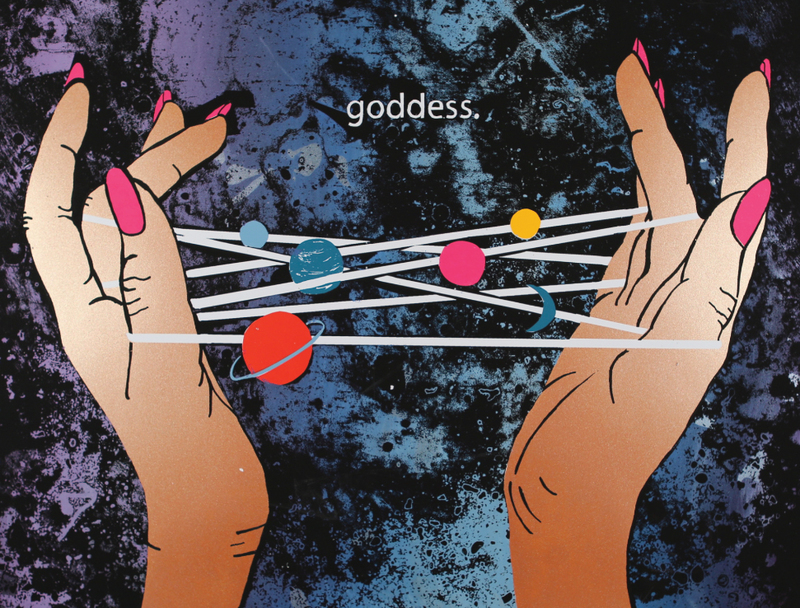 Drucella Anne Miranda’s “Goddess” silk screen in Arte Cura. Notebooks of a Body — Works by first-year MFA students. Verge Center for the Arts, 625 S St., Sacramento, through Aug. 12. Arte Cura — Silkscreen prints by Taller Arte del Amanacer (TANA) workshop participants. Davis Community Gallery, Communicare, 2051 John Jones Road, Davis, through Aug. 31. New Seeds/Semillas Nuevas — Recent posters by TANA student interns. TANA, 1224 Lemen Ave., Woodland, through Aug. 31. One of the artists is Susan Swartz, a painter known for her layered and richly colored landscapes; the other is Andrea Chung, who includes an installation of cyanotype prints (think blueprint) in her exhibition exploring the legacies of Caribbean island colonialism and migration. Both shows highlight the university’s distinctive legacy of nurturing and exhibiting innovative contemporary art, museum officials said in a news release. The exhibitions will run concurrently, June 30 to Sept. 2. (The museum is closed until the exhibitions’ opening.) Note the museum’s summer hours: 11 a.m. to 5 p.m. Tuesday through Sunday (closed Mondays). Admission is free. An “opening celebration” — where both artists will speak about their work — is scheduled for Sunday, July 15, as part of the museum’s Summer Season Celebration. The workshops, to be held July 21 and 28 and Aug. 4, will be led by UC Davis Master of Fine Arts graduates. See below for more information on the artist-led workshops, free Art Studio Drop-In and the Summer Season Celebration. This survey of Swartz’s recent work demonstrates a newfound synthesis and complexity in her approach to abstracting the natural landscape, according to the museum. You broke the ocean in half to get here: Andrea Chung, detail of “Filthy water cannot be washed,” 2016-17, cyanotype and watercolor, 88 x 240 in. From the collection of the Museum of Contemporary Art San Diego. Courtesy of the artist. You broke the ocean in half to be here — In her first traveling exhibition (from the Museum of Contemporary Art San Diego), the San Diego-based Chung showcases her inventive use of collage, printmaking and photography in her work — in this case while exploring a recurring theme of hers: Caribbean island history. Her cyanotype-print installation — another of her unexpected intersections of materials, processes and places — focuses on lionfish, a nonnative, predatory species that has proliferated recently in the Caribbean, conjuring a fantastic underwater world while offering a potent allegory of colonization. Here are this summer’s fee-based workshops, all for ages 16 and up. As of July 9, a few spots remained in each workshop. Drawn From Nature — With Faith Sponsler, M.F.A. ’17. $80, all supplies and materials included. 10 a.m.-4 p.m. Saturday, July 21. Cyanotype Lab — With Arielle Rebek, M.F.A. ’17. $80, all supplies and materials included. 10 a.m.-4 p.m. Saturday, July 28. Abstract Responses to Nature — With Angela Willetts, M.F.A. ’16. $40, acrylic supplies included. 10 a.m.-1 p.m. Saturday, Aug. 4. Registration is required in advance, by calling 530-752-8012 from 8:30 a.m. to 5 p.m. Monday through Friday. People who sign up for all three workshops will receive a 10 percent discount, for a total cost of $180. See the museum’s Exhibits and Programs brochure (available online) for more information. The Force of Nature (July) — Investigate the creative possibilities using reeds, seed pods, bark, seaweed and more — a different material each week. Capture Your Tale Working (August) — Tell your own story through collage, drawing, zines, textiles and more. Exhibition “opening” includes "This Is Our Time: A Conversation With Susan Swartz and Andrea Chung," discussing how they see the world and their place as artists, reflecting and bringing focus to how the world is seen. 3 p.m.